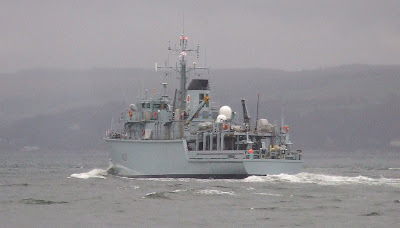 HMS CATTISTOCK, a member of the 'Hunt' Class minehunters was seen back on the Clyde this morning. Attached to the Second Mine Counter Measures Squadron, she is based at Portsmouth where she has recently undergone maintenance. Following a period of sea training, she is shortly due to be deployed to the Northern Arabian Gulf. I hear that there is going to be a number of navy ships visiting Faslane this weekend,have you heard anything yourself? Five minesweepers of the NATO Mine Countermeasures Force are due on Saturday, with HMS ROEBUCK for support. I posted these movements on the AIS Liverpool site.